I found this on The Pioneer Woman Cooks, and I knew I had to make it. A family picnic turned out to be the perfect occasion, because this is indeed: The ultimate picnic food! Easy to prepare, and keeps very well. I didn't cut mine up, though - we just ate them rolled up. Not as pretty, and as usual, not much to photograph, but they sure were tasty. Mix the cream cheese with the leek, basil and lemon zest. Season with a little bit of salt and pepper. Spread this on the tortillas, and make sure to go all the way to the edge - it helps the tortilla roll up nicely. Place the fillings in a line down the center of each tortilla - much as when making sushi. Start with the ham, then add a leaf of lettuce, and plenty of carrot and bell pepper. Finish with the avocado, then roll the whole thing up as tightly as possible. 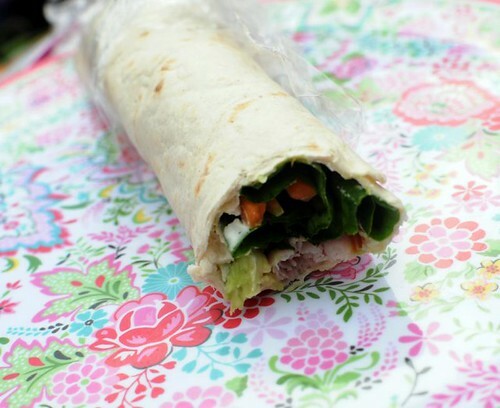 Roll each wrap in plastic, and keep in the fridge - at least for an hour, but longer is fine, too. Perfekt plockmat, bokmärker för framtiden! Was trying to decide what to bring to an end of summer picnic over here is the Seattle area when I happened to check your blog. These worked out perfectly yesterday and were enjoyed by many!